Avocado has a huge potential for the human body, this fruit is rich in vitamins b and E, and also contains a large number of trace elements. It is best to use raw - so you save all the useful properties. Select and have avocados. Buying fruit at the store, note its elasticity. A ripe avocado will be softer, but still retain their shape. If you have purchased unripe fruit, just put it in a dark place at room temperature for a few days. Wash it, cut it in half, leaving the large bone on the same side. Thin layer remove the hard peel, remove the stone. Cut avocado cubes or thin petals. The easiest way to use fruit is to spread it thin on a slice of bread, sprinkle with lemon, optional salt. Avocado is rich with fats and enough calories, so this sandwich is perfect for Breakfast. Make the pate. Mash with a fork the flesh of the avocado, add salt and pepper, a little lemon juice and olive oil. Thoroughly mix all ingredients. Apply the paste on bread, toast or crackers. Slice the avocado into thin slices, salt and pepper. Drizzle with olive oil and add a little lemon juice. A light snack will satisfy even the most refined gourmets. Prepare the salad with avocado and shrimp. Their combination will surprise you with its balanced and full-bodied taste. Defrost shrimp, peel them from the shell, leaving only the tail. Wash lettuce and dry on a clean towel. Have avocados, get rid of the peel and cut into petals. Peel the grapefruit, remove the membrane and break into small pieces. Put a wide bowl of torn lettuce, top off with grapefruit. Next, place the avocado and shrimp. Salt the salad, sprinkle with lemon juice and drizzle with olive oil. This salad should not be mixed, so as not to damage the delicate avocado that will spoil the appearance of the finished dish. 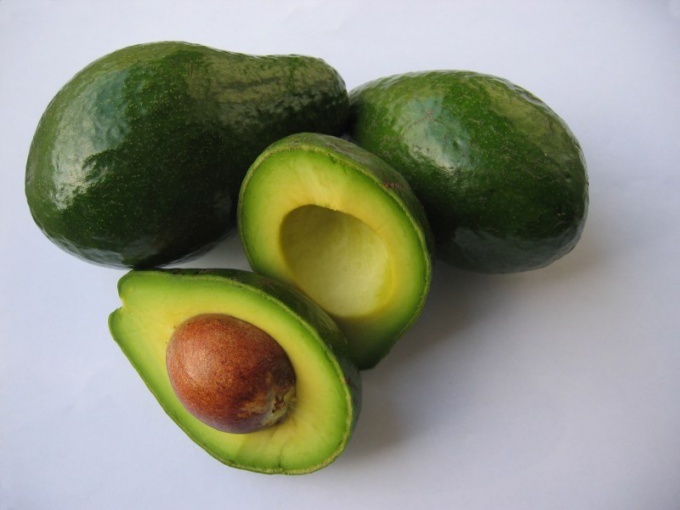 Eating avocados constantly, you will notice positive changes in the structure of your skin. She will become younger, smoothed to get rid of redness and inflammation. The lemon juice helps the avocado to stay fresh and not lose an attractive appearance in a salad. Without it, the fruit it gets dark pretty fast.